I am a bit of a freak about sunscreen. I haven’t always been. I can remember sitting in the sun with baby oil on as a teenager. I can remember sitting in the sun with Hawaiian Tropic SPF 4 oil on as a college student. As I got older, I started using sunscreen more and more. As I became a mother, I went through bottles of sunscreen, the higher the SPF, the better. As I became the mother of a blue-eyed, red head, I started buying sunscreen at Sam’s Club, in bulk. Last year, after my mother actually called my legs pasty looking, I started buying moisturizer with self-tanner in it. I will say that I do tan rather easily. I have noticed, though and especially as I have gotten older, that my arms take to the sun less and less. We had a few days of summer early this spring and I had sun poisoning. This did not surprise me as my paternal grandmother always got sun poisoning. A month or so ago, I was in a Sephora store – a real luxury as there is not one near my home – and signed up as a beauty insider. This is Sephora’s way to reward those of us who spend big bucks in their brick and mortar stores or their online store. Part of the deal is you also receive preferential emails. Last week, I received an insider email from Sephora that was a sample package of sun protection products. A quick check of my upcoming expenses and the current balance on my debit card and off I went to order it. Yesterday, I heard the back screen door open – this took a lot as I had to train the UPS guy to open the door and put my parcels inside – and there was the Sephora box. First off, I have to tell you that I have only ever ordered twice from Sephora online. The items ship quickly and come in an appropriate sized box. I love the fact that the boxes are filled with actual tissue paper as I hate dealing with packing peanuts. 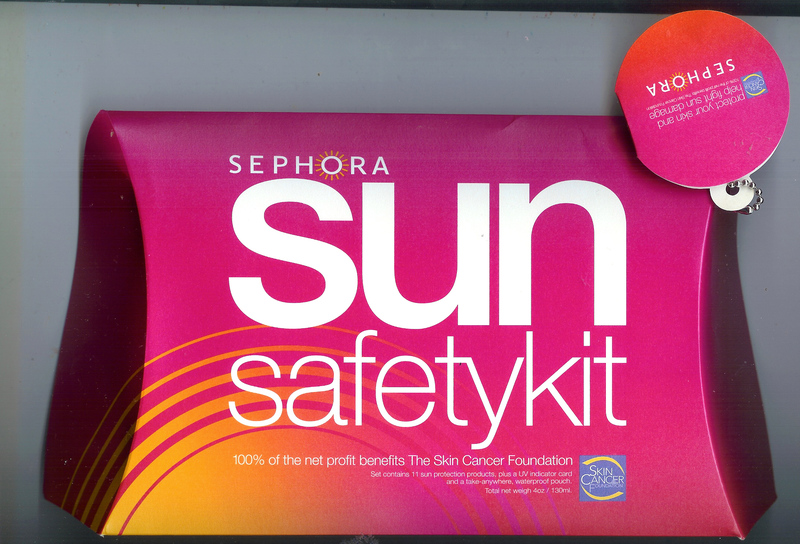 Inside was my Sephora sun safety kit which 100% of the net profits benefit The Skin Cancer Foundation. Inside the sun safety kit was mdskincare sun protection towelettes (SPF 30), Shiseido Ultimate Sun Protection Cream for face (SPF 55), DDF Daily Protective Moisturizer with SPF 15, Sunscreen Face Cream in Watermelon (SPF 30 and made in Greece), Clarins Ultra Protection (SPF 30), Medi Matte Oil Control Lotion (SPF 20), smashbox photo finish foundation primer (SPF 15), juice beauty Green Apple Moisturizer SPF 15, Murad firming bronzer (SPF 15) and tarte 24-7 in thursday for lips. Probably even cooler than all the product – and these are all sample sizes but it is cool as I may find the perfect face sunscreen as I have problems with that – is a UV exposure indicator which tells you how strong the UV rays are. This is a never-ending issue in an area that sees a lot of cloudy sun.